Sir Arthur Conan Doyle, Deputy Lieutenant (May 22, 1859 – July 7, 1930), was a Scottish author most noted for his stories about the detective Sherlock Holmes, which are generally considered a major innovation in the field of crime fiction, and the adventures of Professor Challenger. He was a prolific writer whose other works included science fiction stories, historical novels, plays and romances, poetry, and non-fiction, although is primarily known as the creator of Holmes. The enduring legacy of Sherlock Holmes is based on the rise of scientific methods in Western culture. The ability to investigate the smallest details and reason became prized cultural values in the West. Holmes' analytical abilities made him a new kind of hero, one who uses his mind to succeed. Like Victor Hugo, Doyle became increasingly interested in spiritualism and spiritual phenomena as he grew older. Arthur Conan Doyle was born on May 22, 1859, in Edinburgh, to Irish parents Charles Altamont Doyle and Mary Doyle. He was sent to the Jesuit preparatory school Stonyhurst at the age of nine, and by the time he left the school in 1875, he had rejected Christianity to become an agnostic. From 1876 to 1881, he studied medicine at the University of Edinburgh, including a period working in the town of Aston (now a district of Birmingham). Following his term at university he served as a ship's doctor on a voyage to the West African coast, and then in 1882 he set up a practice in Plymouth. He achieved his doctorate, specializing in Tabes Dorsalis in 1885. His medical practice was not very successful, so while waiting for patients, he began writing stories. His first literary experience came in Chamber's Edinburgh Journal before he was 20. It was only after he subsequently moved his practice to Portsmouth that he began to indulge more extensively in literature. His first significant work was A Study in Scarlet, which appeared in Beeton's Christmas Annual for 1887, featuring the first appearance of Sherlock Holmes, who was modeled after Doyle's former university professor, Joseph Bell. Interestingly, Rudyard Kipling congratulated Doyle on his success, asking "Could this be my old friend, Dr. Joe?" While living in Southsea he helped form Portsmouth F.C., the city's first football club. Common myth has it that Doyle played as the club's first goalkeeper; however, Doyle played for an amateur side (the first goalkeeper of the professional team was Matt Reilly). In 1885, he married Louisa (or Louise) Hawkins, known as "Touie," who suffered from tuberculosis and eventually died in 1906. He married Jean Leckie in 1907, whom he had first met and fallen in love with in 1897, but had maintained a platonic relationship with her out of loyalty to his first wife. Doyle had five children, two with his first wife (Mary and Kingsley), and three with his second wife (Jean, Denis, and Adrian). In 1890, Doyle's interest in medicine led him to study the eye in Vienna. When his studies were completed, he moved to London in 1891 to set up a practice as an ophthalmologist. He wrote in his autobiography that not a single patient crossed his door. This gave him more time for writing, and in November 1891, he wrote to his mother: "I think of slaying Holmes…and winding him up for good and all. He takes my mind from better things." In December 1893, he did so in order to dedicate more of his time to more "important" works (namely his historical novels), pitting Holmes against his arch-nemesis, Professor Moriarty. Following the Boer War in South Africa at the turn of the twentieth century and the condemnation from around the world over the United Kingdom's conduct, Doyle wrote a short pamphlet titled “The War in South Africa: Its Cause and Conduct,” which justified the UK's role in the Boer War, and was widely translated. Doyle believed that it was this pamphlet that resulted in his being knighted and appointed as Deputy-Lieutenant of Surrey in 1902. He also wrote the longer book The Great Boer War in 1900. During the early years of the twentieth century, Sir Arthur twice ran for Parliament as a Liberal Unionist, once in Edinburgh and once in the Border Burghs, but although he received a respectable vote, he was not elected. Conan Doyle was involved in the campaign for the reform of the Congo Free State, led by the journalist E. D. Morel and the diplomat Roger Casement. He wrote "The Crime of the Congo" in 1909, a long pamphlet in which he denounced the horrors in Congo. He became acquainted with Morel and Casement, taking inspiration from them for two of the main characters of the novel The Lost World (1912). He broke with both when Morel (a leftist) became one of the leaders of the pacifist movement during the First World War, and when Casement committed treason against the UK during the Easter Rising based on his Irish nationalist views. Doyle tried, unsuccessfully, to save Casement from the death penalty, arguing that he had been driven mad and was not responsible for his actions. It was partially as a result of this case that the Court of Criminal Appeal was established in 1907, so that Conan Doyle not only helped George Edalji, his work helped to establish a way to correct other miscarriages of justice. The story of Conan Doyle and Edalji is told in fictional form in Julian Barnes's 2005 novel, Arthur & George. In his later years, Doyle became involved with spiritualism, to the extent that he wrote a Professor Challenger novel on the subject, The Land of Mist. One of the odder aspects of this period of his life was his book The Coming of the Fairies (1921). He was apparently totally convinced of the veracity of the Cottingley fairy photographs (since revealed to be a hoax), which he reproduced in the book, together with theories about the nature and existence of fairies and spirits. In his The History of Spiritualism (1926) Doyle highly praised the psychic phenomena and spirit materializations produced by Eusapia Palladino and "Margery" (Mina Crandon), based on the investigations of scientists who refused to listen to well-informed conjurors. After the death of his wife Louisa in 1906, and the deaths of his son Kingsley, his brother, his two brothers-in-law, and his two nephews in World War I, Doyle sank into depression. 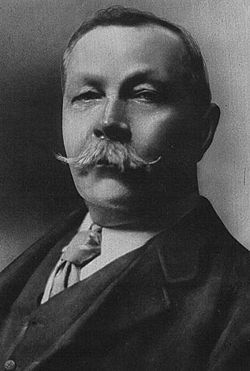 Sir Arthur Conan Doyle died of a heart attack in 1930, aged 71, and is buried in the Church Yard at Minstead in the New Forest, Hampshire, England. He found solace supporting spiritualism and its alleged scientific proof of existence beyond the grave. Conan Doyle was friends for a time with the American magician Harry Houdini, a prominent opponent of the spiritualist movement. Although Houdini insisted that spiritualist mediums employed trickery (and consistently attempted to expose them as frauds), Conan Doyle became convinced that Houdini himself possessed supernatural powers, a view expressed in Conan Doyle's The Edge of the Unknown. Houdini was apparently unable to convince Doyle that his feats were simply magic tricks, leading to a bitter, public falling-out between the two. Richard Milner, an American historian of science, has presented a case that Doyle may have been the perpetrator of the Piltdown Man hoax of 1912, creating the counterfeit hominid fossil that fooled the scientific world for over 40 years. Milner says that Doyle had a motive, namely revenge on the scientific establishment for debunking one of his favorite psychics, and that The Lost World contains several encrypted clues regarding his involvement in the hoax. Samuel Rosenberg's 1974 book Naked is the Best Disguise purports to explain how Conan Doyle left, throughout his writings, open clues that related to hidden and suppressed aspects of his mentality. Conan Doyle is remembered for his most-famous creation, the detective Sherlock Holmes, and the many stories he wrote about Holmes. Since Conan Doyle’s death, the Sherlock Holmes character has appeared in numerous publications. Undershaw, the home Conan Doyle had built near Hindhead, south of London, and lived in for at least a decade, was a hotel and restaurant from 1924 until 2004. It was then bought by a developer, and has sat empty since then while conservationists and Conan Doyle fans fight to preserve it. A statue has been erected in Sir Arthur Conan Doyle's honor at Crowborough Cross in Crowborough, East Sussex, England, where Sir Arthur lived for 23 years. There is also a statue of Sherlock Holmes in Picardy Place, Edinburgh, Scotland—close to the house where Conan Doyle was born. ↑ Arthur Conan Doyle, An Essay Upon the Vasomotor Changes in Tabes Dorsalis, Edinburgh Research Archive. Retrieved May 18, 2007. ↑ Life Style Extra, Sherlock Homes Fans Save Author’s Home, May 15, 2007. Retrieved May 18, 2007. ↑ Roger Highfield, The mysterious case of Conan Doyle and Piltdown Man, Electronic Telegraph 664 (March 20, 1997). Retrieved May 18, 2007. Works by Arthur Conan Doyle. Project Gutenberg. Sir Arthur Conan Doyle - The majority of his works in easy to read HTML format. The Chronicles of Sir Arthur Conan Doyle – Site includes articles, quotes, games, and little-known facts. History of "Arthur Conan Doyle"
This page was last modified on 23 November 2016, at 20:08.